Homophones are words that sound the same, but have different meanings and spellings. 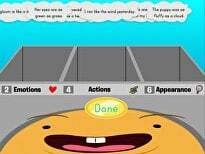 In these examples of everyday talk, choose the correct spellings to fill in the blanks. Your students will practice using sentence clues to identify the meaning of homographs. 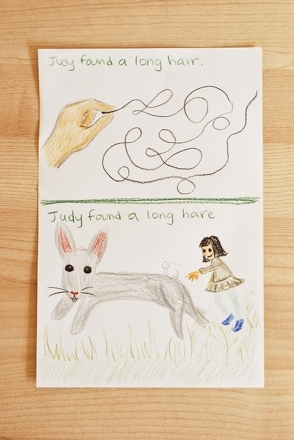 Work on homophones, words that sound the same, and spelling with this imaginative activity! This homophones worksheet focuses on words that sound the same but have different meanings and spellings. Learn about homophones, or words that sound the same but have different meanings and spellings, in this fun worksheet. Practice spelling some common compound words with this spelling test and activity. Combine dollars and cents with spelling sense in this 3rd grade spelling test that works with money-related sight words. Homophones are two or more words that sound the same but have different meanings. 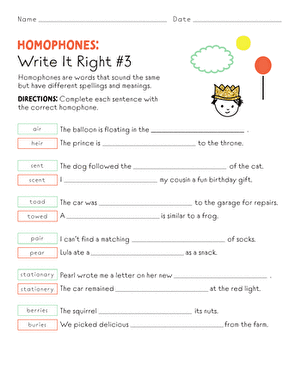 Help your kid use homophones like "air" and "heir" correctly in our worksheet. Students will learn common animal sound words in different languages!